How green is your studio? PC Notes explains the simple measures that can reduce PC power consumption and cut your electricity bills. Very few of us would leave our studios powered up permanently, mostly because of our electricity bills (particularly if we have power–hungry analogue synths and high–wattage amps), but also because of the very real risk of fire: more than one studio has been burnt to the ground when no–one was there to notice the first stray wisp of smoke coming out of a power amp. Nevertheless, some PC users leave their machines switched on 24 hours a day, seven days a week, in an effort to avoid stressing the components with regular powering up and down. On the other hand, we're constantly being reminded about the 'hidden' standby consumption of everyday appliances, including TVs and mobile phone chargers, and many of us are replacing our traditional 60W light bulbs with 11W low–energy equivalents. So let's take a look at how we can keep those PC electricity bills down as well! Leaving your PC permanently switched on is bad enough from the energy standpoint, but musicians face an even worse scenario, since for audio work you need to make sure the Power Scheme is set to 'Home Office/Desk' for Windows XP, or 'High Performance' for Windows Vista. This will disable CPU–throttling schemes such as Intel's Speedstep and AMD's Quiet 'n'Cool, and ensures that your processor runs permanently at its highest clock speed, avoiding the risk of the audio drop–outs that often occur during the short period when the clock speed is altering. However, running your CPU at its top speed all the time has a down side: increased power consumption. 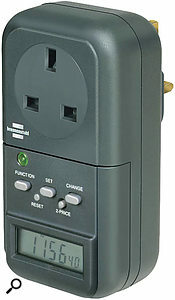 In practice, while most music PCs are routinely fitted with power supplies capable of supplying 400 Watts or more, a typical mid–range musician's PC might consume up to several hundred watts when it's running flat out, but this will probably drop to around 100 Watts when idling, helped by a wise choice of graphics card (see 'Power-hungry Graphics' box). Nevertheless, if you leave it idling in this state for 24 hours a day it will still consume 2.4kWh (kilowatt–hours) of energy, which will cost you exactly the same as running a 1kW electric fire for 2.4 hours. The key to minimising power consumption on a daily basis is to keep the idling power requirement as low as possible, since our computers generally spend a lot of time sitting around waiting for us to ask them to do something. You can save energy by buying one of the latest LCD monitor screens, such as this BenQ 24-inch G2400W widescreen model, which only consumes 55W of power.Some audio interface manufacturers advertise models (such as the Alesis iO/2) that are optimised for minimal laptop battery drain, but most audio interfaces only take between four and 10 Watts maximum anyway, similar to the average low–energy light bulb. RAM is only likely to consume around 10 Watts per 2GB, as does a single hard drive. It's generally the CPU that consumes the most juice, followed by the monitor screen, and then the graphics card. So, starting with some sensible choices of PC components, how can we minimise idling power consumption even further? Well, the quickest way is to change your Windows XP Power Scheme from 'Home Office/Desk' to 'Portable/Laptop', or, if you're using Vista, from 'High Performance' to 'Balanced', since this enables Intel's Speedstep or AMD's Cool 'n' Quiet features, so that the CPU can be throttled down when full power isn't required. If you want to check your clock speed in real time, to confirm that the throttling features are correctly enabled, try running RightMark's excellent CPU Clock utility (http://cpu.rightmark.org/products/rmclock.shtml), which runs on Windows 2000, 2003 Server, XP and Vista, and which can display the current clock speed in the System Tray. As we know, CPU throttling may result in audio issues, but switching from your 'green' setting to 'full–on audio performance' only involves changing this single setting on demand, or you could set up two User Accounts with different power schemes and switch between them. Personally I maintain a dual–boot system, with one general–purpose Windows partition tweaked for Internet, word processing, accounts and energy saving, and the other set up with all my audio applications, plug–ins, soft synths and sample libraries ready for audio use. If you don't want to compromise the CPU performance of your audio–only PC, or risk audio drop–outs, at least check that your chosen power scheme switches the monitor screen off after perhaps 20 minutes of non–activity. This will ensure that it stays on during playback of your longest audio projects, but drops into its standby mode after that, typically reducing LCD monitor power consumption to just two or three Watts instead of the 50–200 Watts it normally uses. Screensavers are counter–productive for energy saving, because they leave the monitor screen switched on and therefore consuming lots more power. This is the biggie for the energy conscious: switching your PC from its idling mode to a deeper state that uses less power. If you want to really minimise your Windows XP power consumption when you're away from your PC, switching it to the Standby S1 mode will help considerably, since this removes the power to your hard drives and peripherals, puts your monitor screens in standby and switches your CPU to a standby mode that consumes significantly less (the amount varies from CPU to CPU, but, for instance, E6600 and Q6600 processor drain might drop to under 40W). Overall, if we assume 100W idling plus perhaps 70 for the monitor, overall standby consumption might drop to around 50W or so in default S1 mode — which is a considerable saving if you're away from your PC for an hour or more! Even better, most modern PCs running Windows XP can be persuaded to enter an even deeper S3 standby mode that drops power consumption to just a couple of Watts, by turning off all components in your PC except for the RAM. If all the fans in your PC stop spinning when you enter standby, you're already configured for S3 mode (my dual–core PC built in December 2006 did this by default). If not, have a read of the helpful guide from eXoid (www.exoid.com/?page_id=47). The big disadvantage of Windows XP's Standby modes is that if you have a power cut you'll lose any data that hasn't been saved (although you can, obviously, avoid this possibility by saving any work beforehand). For longer and safer times away from your PC, Hibernation instead saves an image of your entire RAM contents to your hard drive and then powers down your PC, so while reaching the desktop will take longer when you resume, you're protected against power cuts. Windows Vista features a more sophisticated Sleep mode that, by default, kicks in automatically after one hour, is more efficient at detecting an idling computer, and simultaneously saves all active documents, applications and settings to both RAM and hard drive, so that it can either quickly resume using the data in RAM (typically within a couple of seconds rather than the five seconds of Windows XP), or more slowly if the power has been cut in the meantime. It also typically drops power consumption to just a couple of Watts. Arguments abound on whether to leave your PC running for the entire working day, but I personally consider this a waste of energy. I force mine to Standby/Sleep mode before I go for lunch and turn it off at the end of each working day (which in reality sends it into a 'Soft Off' mode with a power consumption of a couple of Watts). I also physically unplug my PC from the mains supply during bad weather and when away from home, to avoid possible damage during thunderstorms (which can fry electrical gear in an instant). By my calculations, if the average music PC is working for eight hours a day and idling for 16, that 16 hours will consume about 1000kWh per year if you just leave it idling, 300kWh per year if in Standby S1 mode, and just 30kWh per year in S3 mode. At typical UK electricity prices that equates to £110, £33, and £3.30 respectively. Personally I'd prefer to spend that extra £100 on new gear! The modest graphics cards we musicians favour because of their fanless (noiseless) cooling consume considerably less power than the average 3D gaming card, many of which now require far more power than the typical CPU! For instance, my E6600 (2.4GHz Conroe) Core 2 Duo processor has a Thermal Design Power of just 65W, while the popular Q6600 (2.4GHz Kentsfield) Core 2 Quad has a TDP of 95W. Contrast that with a reasonably fast 3D card such as a GeForce 7800 GTX 512, which can consume 100W when its 3D engine is running flat out, a little over 50W when running flat out with 2D graphics, and nearly 30W even when idling. No wonder it needs those large heatsinks and noisy fan! Moreover, if you're even remotely concerned about power consumption you'd better avoid the Geforce GTX 280 3x SLI. Utilising three graphics cards together for stunningly fast game graphics is one thing, but the peak 3D consumption of this triple graphics card combination rises to a staggering 520W! Keep an eye on the energy consumption of both your PC and the rest of your studio with a Mains Energy Monitor such as the Brennenstuhl PM230 shown here.By contrast, the modest Gigabyte 7300LE graphics card that I recommended in my original 'Building your own Dual–core PC' feature back in SOS February 2007 takes a tiny 16W with its modest 3D engine running flat out, just over 10W flat out with 2D graphics, and only 9W when idling. When running the 2D graphics used by all audio applications this graphics card will never consume more than 10W — which is far less than a CPU — so, clearly, choosing a modest graphics card can reduce the idling consumption of a music PC by a significant amount. If you want to find out the power consumption of a particular model, one of the best charts I've discovered on the Internet can be found at http://mark.zoomcities.com/images/gfx/GFXpowerchartby3d.png. Your choice of monitor screen can also have a big impact on overall consumption. CRT monitors of 15 to 20 inches typically consume around 100W, and 24–inch ones up to 200W, while LCD monitors generally come in at about half these amounts, as well as generating a lot less heat. 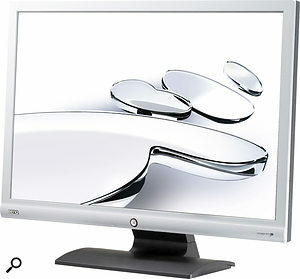 However, more recent LCD monitors can be even more energy efficient: the BenQ 24–inch G2400W widescreen LCD (www.benq.com), for instance, only consumes 55W! As it happens, lots of musicians already use LCD monitors, because they also solve interference problems with nearby electric guitars, and have less impact on room acoustics when placed between your monitor speakers, so we're already inadvertently making sensible energy–saving decisions. 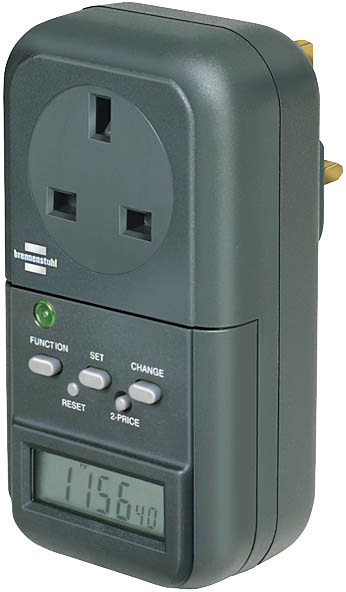 If you want to measure the power consumption of your PC — or any other mains appliance, for that matter — the easiest approach is to buy a Mains Energy Monitor. One of the most popular is the Prodigit 2000M (www.prodigit.com/e2000m.htm), available from Maplin (www.maplin.co.uk/module.aspx?ITAG=SPEC&ModuleNo=38343) for just £28, and also found in the US as 'Kill A Watt EZ Electricity Meter' for around $40, but I also tracked down the slightly more sophisticated Brennenstuhl PM230 model for just £14.95 plus VAT in the UK, from PAT Training Services (www.pat–training.co.uk/230V_electricity_meter.htm). You just plug the device under test into it and get a read–out in real time of the number of Watts it's consuming, or the energy in kilowatt hours. Expect a few eye–openers as you try it on different appliances!